It’s not easy to know, sometimes, where we’re from. Where our roots are. Where we’ve been. Where we’re going. Seems like for most people these answers come easier as you get older, but for me I think they actually get harder. Because all my experiences are jumbled, yet separate. And all I know most days is I’m just soldiering on, head down, putting one foot in front of the other. And many nights, after all those steps, I wonder if maybe I should be looking up a little more, farther ahead, keeping at least an eye on what’s to come. Which is why, when I came across this poem my first-born had tossed into a “keep” pile after I made her clean out her backpack, I had to catch my breath. Her voice, now with the tenuous confidence of a tween, carried by her written words, hits me with its introspection. The details she remembers from her first five years slay me, as that time was a blurry balancing act of babies, work and drastic family changes. I read. And I remember. I remember how much she loved the snow, and how happy she is now on the rare occasion we get even a dusting. I remember the games of street ball and how careful she was, to watch for cars and think about how she falls right back into that natural caution when we visit busy city streets. I remember the yard sales and the bitter, angry neighbors, and am surprised she does, too. I remember many hours spent on the front steps in our postage stamp green space, but I struggle to remember which neighbor is the one who taught them to “properly” eat watermelon. I remember her round toddler face in fearful anticipation as we would get closer to the yard with the huge, barking dogs. I remember it all, though there’s already a layer of life’s haze settling in. And I wonder if I’m looking up enough. Because these details aren’t just lines in a poem, just part of an assignment. They’re paths of her journey, connecting her to where she’s from. And while I’m enjoying the moment, her path is leading her to who she is. One foot in front of the other. 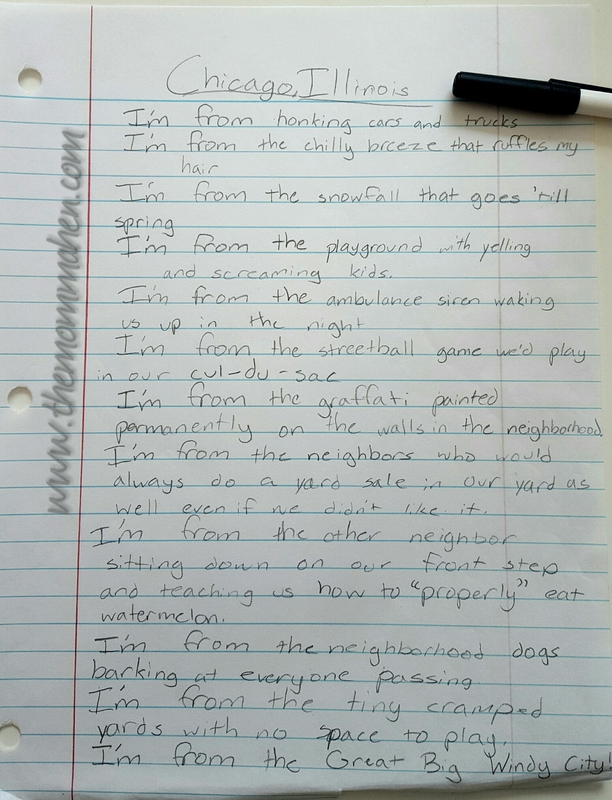 Do you remember the I’m from, I’m going to exercise we did in 511?